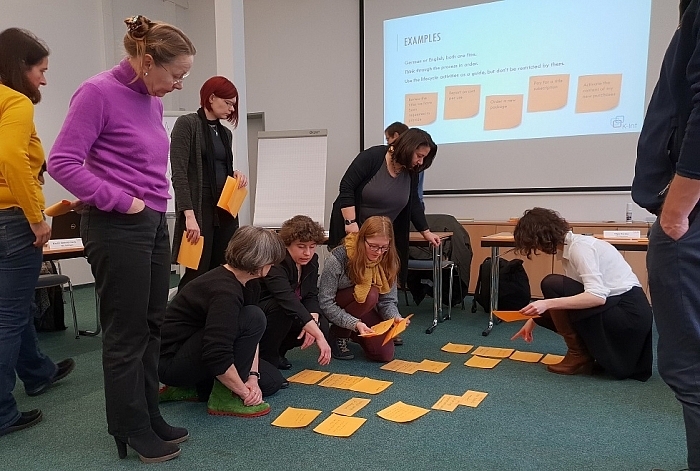 Our project with the GBV Common Library Network folks got off to an excellent start at the kick-off workshop in Göttingen, Germany. Library specialists and software developers from Europe and North America gathered to share their knowledge and insight into Electronic Resource Management. After an interesting (yes, honestly!) discussion about terminology attention turned to the processes and tasks involved. Despite having two full days we knew we didn’t have time to cover all aspects of the core process so we selected three core topics to focus our energy on: managing renewals and requests for access to resources, activating access to content, and managing licences. Owen Stephens did a fine job facilitating the discussion and getting everyone involved. At the end of a very full two days participants had shared enough knowledge for us to begin assembling user story maps and a backlog for the first round of development. Verbundzentrale des GBV (VZG) were very gracious hosts. Participants were treated to a special viewing of the beautiful library hall and a post-workshop social.